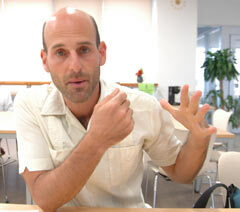 David Vine, an assistant professor at American University gave an interview at Okinawa Christian University on August 7. A written account by the students of American University in Washington who attended the lecture by Kevin Maher, former director of the State Department’s Office of Japan Affairs and former consul general in Okinawa Prefecture, exposed his derogatory remarks about the people of Okinawa. David Vine, assistant professor at American University and the supervisor of the students in question, was interviewed by the Ryukyu Shimpo on August 7. Vine claimed that this is a structural issue within the US government and is not confined to the former director of the State Department’s Office of Japan Affairs. Vine visited Okinawa to participate in “Dialogue Under Occupation,” international conference (hosted by DUO Conference Executive Committee), which was held in Okinawa International University and Okinawa Christian University from August 6.